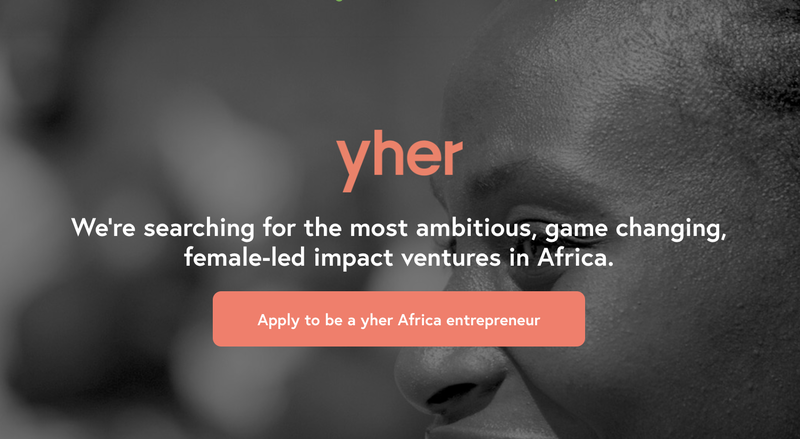 The Yher Africa Accelerator Program 2019 is open for applications. YGAP is searching for the most ambitious, game changing, female-led impact ventures in Africa. The exclusive accelerator program aims to back female-led impact ventures across Africa. The yher Accelerator Program is a powerful opportunity for passionate female impact entrepreneurs in Africa who are at the early stages of building businesses and organisations that exist to change their communities, with a preference for those who are improving the lives of women and girls in Africa. has already launched a business that is making a difference in their community or in the lives of the women and girls (by improving education, health, homes or creating good jobs)? wants to scale their venture to impact many more people? is on a clear path to revenue? ACCELERATOR – A week-long intensive entrepreneurship program designed to fast track your early stage venture. We’ll provide training and mentorship while also connecting you to an inspiring group of fellow female entrepreneurs working hard to create a better world. MENTORSHIP – Connection to a network of mentors from across the world throughout the Accelerator week, providing you with a wealth of entrepreneurship experience to help you build a bulletproof strategy for impact and growth. HIGH-TEA – An opportunity for you to network with potential funders, mentors and supporters and to pitch your venture as the week comes to a close at an exclusive, invite-only high-tea event. FUNDING – A total of $25,000 in prize funding is available for the winners of our peer review and audience votes. GROWTH SUPPORT – Potential to qualify for Growth support, including ongoing tailored support and grant or investment funding of $10,000 to $50,000 AUD to help scale your venture. COMMUNITY – Ongoing connection with our virtual community to help you along your entrepreneurial journey. Keep each other inspired and accountable with monthly check-ins, mastermind sessions and knowledge sharing. They encourage you to use your networks or crowd funding sites to raise the funds necessary to cover your travel. If you have made attempts to raise funds yourself and are still unable to afford to attend, they do have some travel scholarships available. Female-Led Ventures: You must have at least one female co-founder who will participate in the program. Local: You intimately understand the problem that you are trying to solve. Social Impact: Your venture must exist to improve the lives of people living in poverty. Support Women and Girls: While not required, we preference ventures that have a clear mandate or mission to uplift females in some way. In the Early Stages: You will have already launched a venture or run a pilot and have some early traction or proof of concept. You will typically have less than 100 customers or clients and have been in operation less than two years. Apply now for access to world-class training, funding and support for your venture. For more information, visit yher Africa.